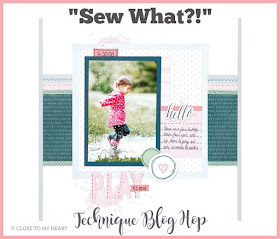 Welcome to the CTMH "Sew What!? 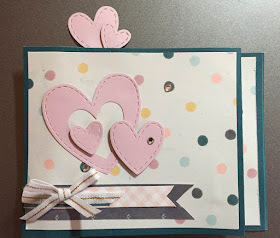 "Blog Hop! 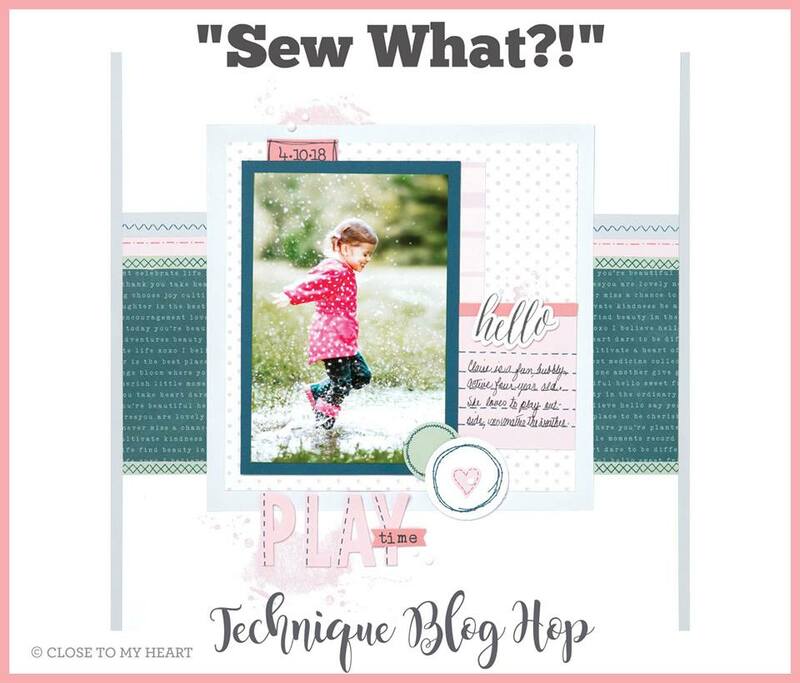 The theme for the September CTMH Technique Blog Hop is "Sew What!?" 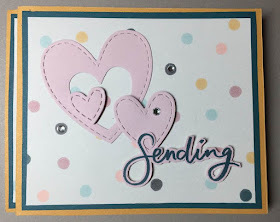 This blog will demonstrate artwork using any type of stitching, from faux stitches, hand stitching and machine stitching along with other CTMH products. I'm excited to see the creative use of stitching on this hop. If you are coming from Marciava Warrell's blog, you are on the right track. In case you get lost, you can get a complete list of participants at the bottom of Melissa Robinson's blog. 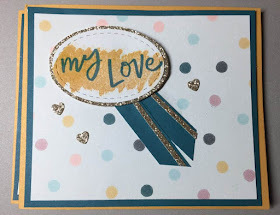 This month we have 13 Close to My Heart Consultants sharing their creations using the "Sew What!?" theme. To enjoy this hop is quite simple to do - just click on the link at the bottom of the post on each blog to move to the next one. Here we go! I just LOVE our new thin cuts with embossed stitching - gives that additional "step-up" of eye entertainment! So that's my "go to" for this technique - also so very quick and easy which fits my busy schedule. This is the first time I'm making the "Wiper card". 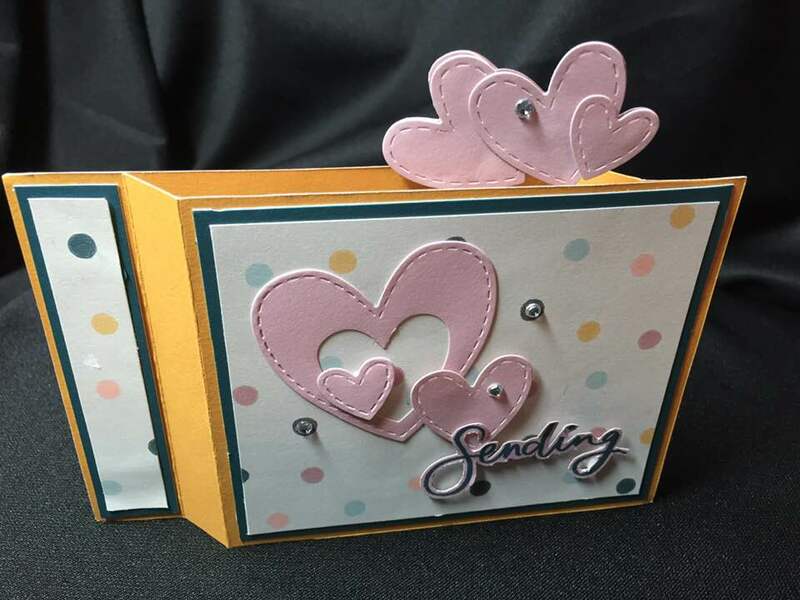 I got my instructions from https://www.youtube.com/watch?v=nZpouL4jqSs A YouTube video created by Barb Millekin from "Barb Stamps". Oh! No! 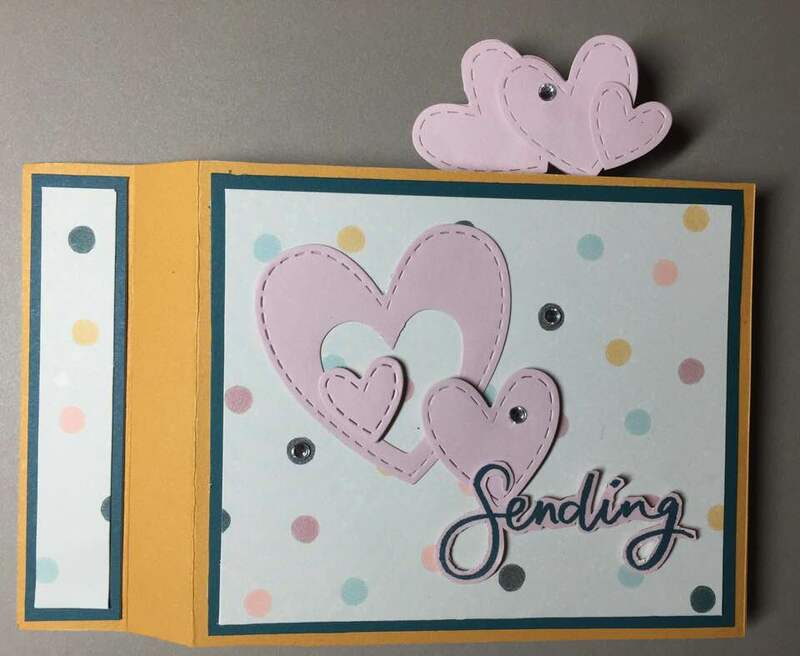 I just took my photos and discovered the hearts pop up when the card is closed and disappear when it's opened! Going back to the tutorial, I've reversed something - moral of the story, don't try something new when you are "time challenged" and very possibly dyslexic. I will be editing my card!! The hearts were cut with Thin Cuts - Stitched Hearts. 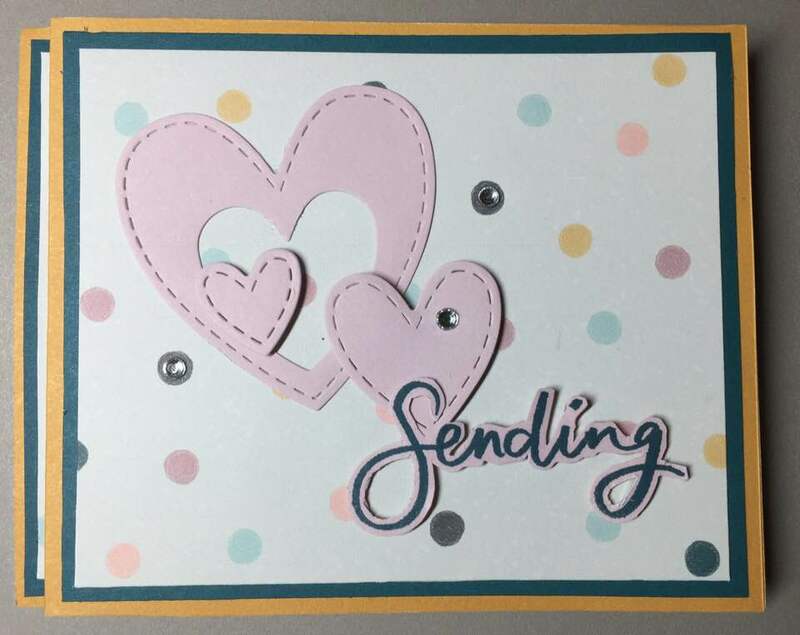 The Saffron cardstock, Sugarplum CS, Boutique paper, sentiment are from the Workshops Your Way Hugs for you Cardmaking Kit. I also added Peacock Cardstock for contrast. The inks used were Saffron and Peacock. The two base saffron rectangles were cut at 4.25" x 6.75"
scored on one short side at 1" and 1.75". The photo shows a white mechanism - I actually cut and used a Saffron piece that you see in the 3rd photo, it protrudes 1/4th of an inch, I cut that off and added a strip of clear plastic for the hearts. 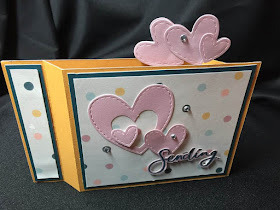 The trick to getting the card to work properly is to have the card open with the mechanism up, then before gluing the card together fold it shut and check that the mechanism closes (disappears). The card is assembled with one scored side on the left (front of the card) and the other on the right side (back of the card). or vise-versa. Then glue only the 1-inch panel on each end. So that a scored side is glued to the non-scored side of the other half. Once the card was assembled (or may be done first), the front, back, and sides were decorated with 4"x 4.75" and 3/4" x 4" Peacock - 2 each. 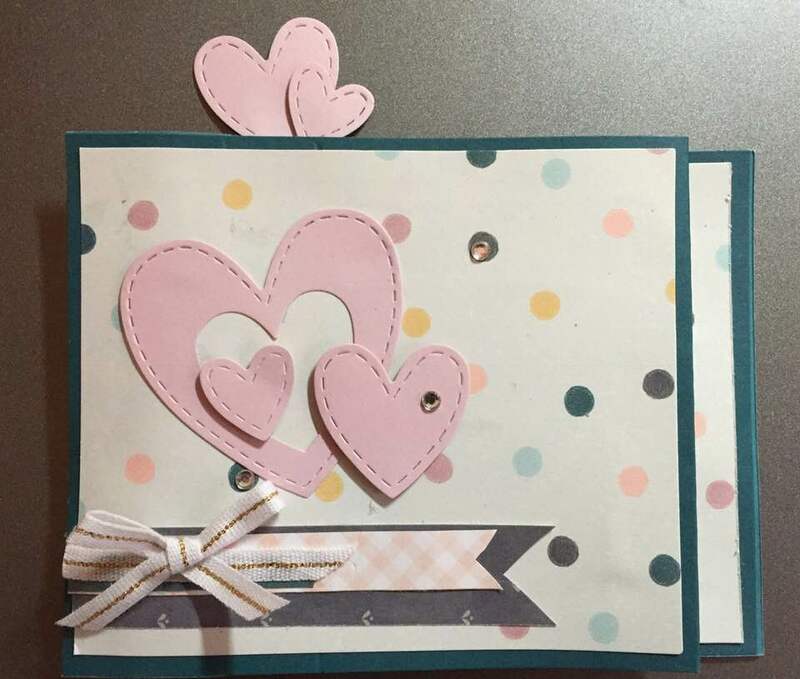 The polka dot paper was cut at 3.75" x 4.5" and 1/2" x 3.75", also, -2 each. Clear Sparkles were added to the front and some gold glitter paper to the back. 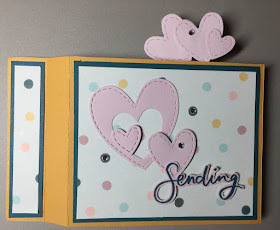 The tiny hearts were cut with the Thin Cuts - Shaker Window and Confetti. In the end, I like how it works. It can even stand upright as shown in the following photo. 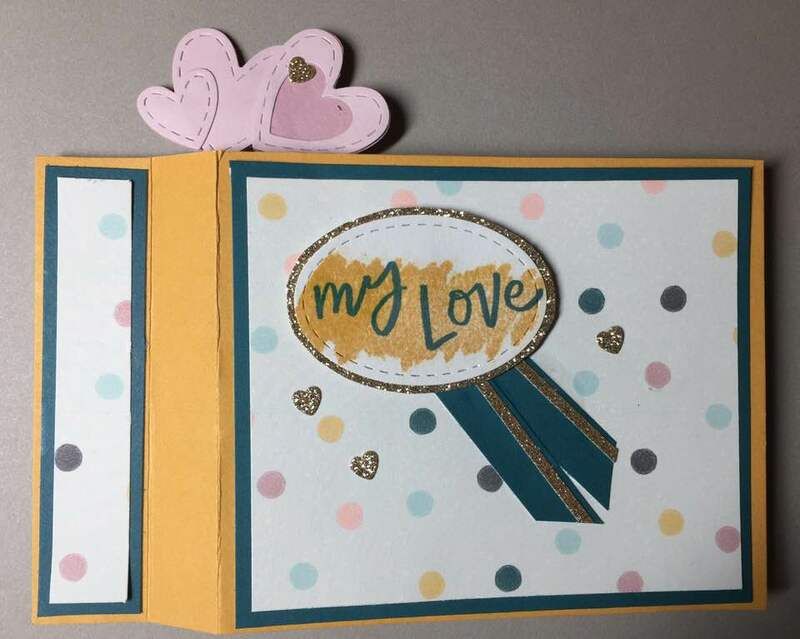 Cute card, Darlys! I'm sure the corrected version will be too. What a fun card! I love all the hearts. Well, I rather like the hearts popping out of the top. I'm going to have to check out that video. Best wishes in the editing process too. Cute little hearts, I had a giggle with your reverse story.